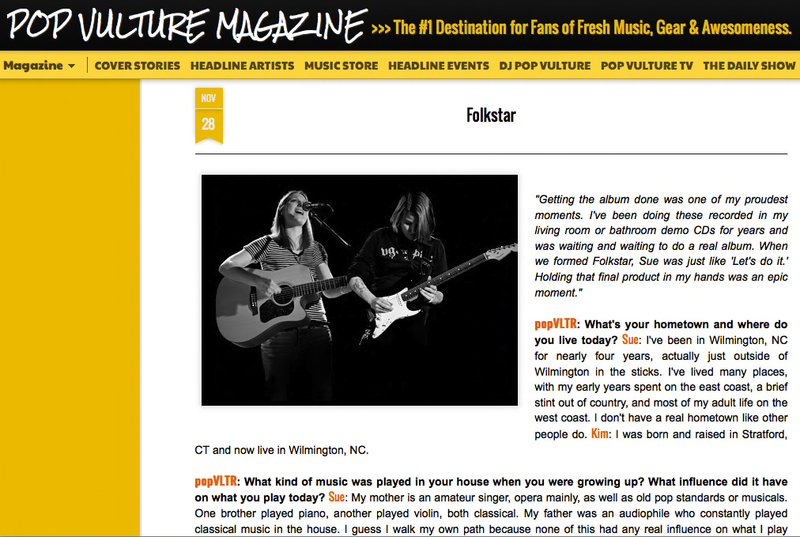 Folkstar’s musical upbringings revealed in Pop Vulture Magazine! popVLTR: What’s your hometown and where do you live today? Sue: I’ve been in Wilmington, NC for nearly four years, actually just outside of Wilmington in the sticks. I’ve lived many places, with my early years spent on the east coast, a brief stint out of country, and most of my adult life on the west coast. I don’t have a real hometown like other people do. Kim: I was born and raised in Stratford, CT and now live in Wilmington, NC. popVLTR: What kind of music was played in your house when you were growing up? What influence did it have on what you play today? Sue: My mother is an amateur singer, opera mainly, as well as old pop standards or musicals. One brother played piano, another played violin, both classical. My father was an audiophile who constantly played classical music in the house. I guess I walk my own path because none of this had any real influence on what I play today. However, my father lent me a tiny radio and I used it to listen to Casey Kasem’s Top 40. He also took me to the library where I borrowed records. Then cable came to our small town – including MTV – and it was a really huge deal. I saw Joan Jett for the first time and it changed my life forever. Kim: My dad is very into the rat pack era. I think he has every Sinatra album ever recorded. My mother likes more classical stuff and adult contemporary. At the time, I hated all of it and dreaded when I was at the mercy of either of them in the car. As I’ve gotten older, however, I’ve noticed that these things have crept into my music. Sometimes I’ll cover some of the “standards” and I like that simplistic jazzy feel of older music. But the stuff my mother likes has taught me to be more subdued and tender I think. My mother also played a lot of piano – she actually put out a contemporary classical album of her own a few years ago. She was a music teacher for a while, so music was very prevalent in the home. She used to come into my kindergarten class and sing songs for us while strumming this ancient 12-string. That’s the first guitar I played on. My brother and I both played piano briefly before he started saxophone and I started to focus on trumpet and later on guitar. So it was pretty much never quiet at the house. popVLTR: What was it like the first time you performed on stage? Do you still feel the same way? Sue: My first performance on stage was at a school dance, with my very first band from high school. I can’t remember if I was nervous or not. I remember I was wearing a Living Colour t-shirt and spandex shorts. I would never wear that horrible outfit again, but it shows how I was much more fearless then. I still make the same weird guitar faces when I play my leads, but these days I’m dealing with terrible stage fright. Kim: I used to give trumpet recitals where my knees would shake but I was OK. But singing…oh God. I started out doing karaoke and I could barely hold the microphone I was so nervous. When I finally played my first solo acoustic show in front of actual people, I thought I was going to die. I was shaking and sweating the entire time and I played the same 13 songs for 2 hours. When I was done, I felt relieved and pretty sure I wanted to do this forever. I still get nervous sometimes, especially in a new venue. But as soon as I get on stage and grab that mic, it’s the happiest feeling in the world. It just took a few thousand instances of wanting to run away or pass out to get over it. popVLTR: What are some of your proudest moments in music so far? Sue: I’m very proud of the first Folkstar album. This was the first full-length album I’ve put out and I love nothing more than writing and creating musical arrangements. I love coming up with clever lyrics, rhythm tracks, or writing a great, raw solo that comes from the depths of my soul. We’re recording the second album right now and I’m just as excited about writing and playing this album, maybe even more so because it’ll likely trump the first. Playing air guitar to my own solo on the radio was pretty cool too. Kim: Getting the album done was one of my proudest moments. I’ve been doing these recorded in my living room or bathroom demo CDs for years and was waiting and waiting to do a real album. When we formed Folkstar, Sue was just like “Let’s do it.” Holding that final product in my hands was an epic moment. Also, mentoring for Girls Rock NC this past summer. We played some songs and talked to these amazing pre-teen girls who put together their own bands and wrote original songs in a week. The whole experience was mind-blowing – these girls were so positive and driven. And props to Heather McEntire (Mount Moriah) for getting us involved. Also, KLCZ, a college radio station out of Idaho, played our whole album in its entirety one morning. It was the first time I’d heard myself on the radio and I really couldn’t contain myself. popVLTR: What cool stuff is on the horizon for you? Folkstar: The most exciting thing right now is our second album which should be out in February 2013 or so, and the tour in support of it next spring/summer. We also started our own record label and are learning a great deal with that whole process. We’re also going to drop our first Christmas single in a couple weeks!